Swiss watchmaker Hublot has introduced a timepiece that can only be purchased using Bitcoin. 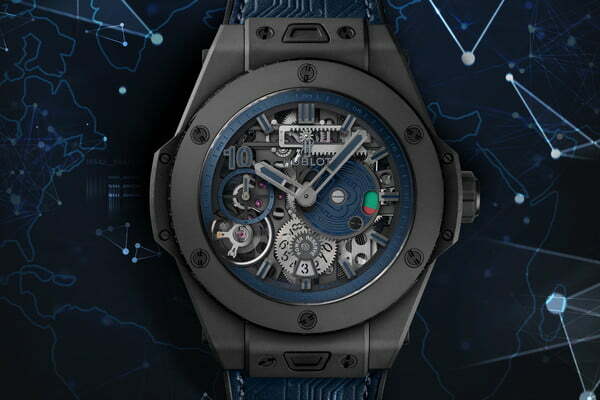 Hublot’s newest was planned as a limited-ed that would cash in on Bitcoin popularity; ostensibly, to honor the 10th anniversary of the cryptocurrency. It may represent a good investment option for Bitcoin holders pending the recovery of the virtual tender. Cryptocurrency geeks will instantly be drawn to decorative elements inspired by the Bitcoin craze. The striking 45mm case is accented with the Bitcoin logo and a special transaction number on the bezel. Even the watch straps feature Blockchain-style embossing. The timepiece boasts a powerful HUB1201 movement with a 10-day power reserve. The watch is also water resistant to more than 328 feet. If you’re wondering how much Bitcoin it takes to buy this timepiece, it equals out to roughly $25,000 in “traditional” tender. If you have a passel of Bitcoin and are feeling financially as well as horologically shortchanged, though, you’re out of luck: all 210 examples of Hublot’s new Big Bang Meca-10 P2P are already accounted for.